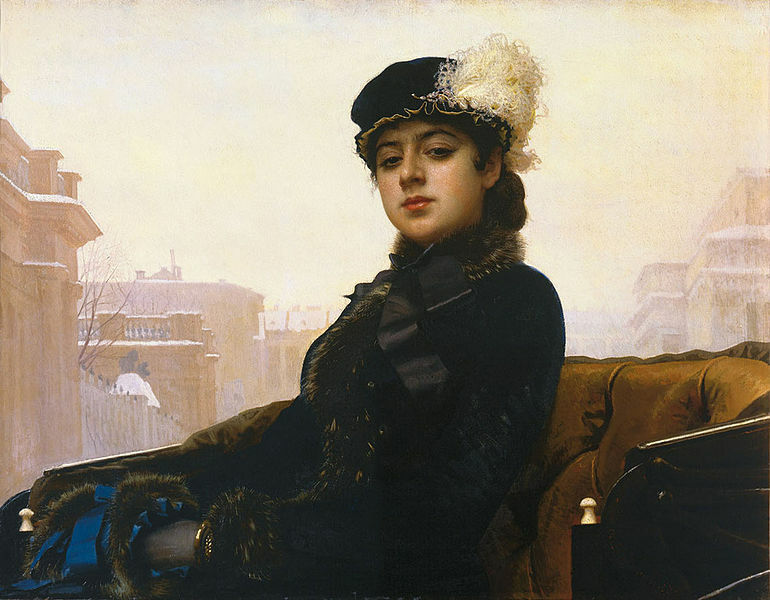 Mihailov sold Vronsky his picture, and agreed to paint a portrait of Anna. On the day fixed he came and began the work. From the fifth sitting the portrait impressed everyone, especially Vronsky, not only by its resemblance, but by its characteristic beauty. It was strange how Mihailov could have discovered just her characteristic beauty. “One needs to know and love her as I have loved her to discover the very sweetest expression of her soul,” Vronsky thought, though it was only from this portrait that he had himself learned this sweetest expression of her soul. But the expression was so true that he, and others too, fancied they had long known it. “That will come,” was the consoling reassurance given him by Golenishtchev, in whose view Vronsky had both talent, and what was most important, culture, giving him a wider outlook on art. Golenishtchev’s faith in Vronsky’s talent was propped up by his own need of Vronsky’s sympathy and approval for his own articles and ideas, and he felt that the praise and support must be mutual. In another man’s house, and especially in Vronsky’s palazzo, Mihailov was quite a different man from what he was in his studio. He behaved with hostile courtesy, as though he were afraid of coming closer to people he did not respect. He called Vronsky “your excellency,” and notwithstanding Anna’s and Vronsky’s invitations, he would never stay to dinner, nor come except for the sittings. Anna was even more friendly to him than to other people, and was very grateful for her portrait. Vronsky was more than cordial with him, and was obviously interested to know the artist’s opinion of his picture. Golenishtchev never let slip an opportunity of instilling sound ideas about art into Mihailov. But Mihailov remained equally chilly to all of them. Anna was aware from his eyes that he liked looking at her, but he avoided conversation with her. Vronsky’s talk about his painting he met with stubborn silence, and he was as stubbornly silent when he was shown Vronsky’s picture. He was unmistakably bored by Golenishtchev’s conversation, and he did not attempt to oppose him. Altogether Mihailov, with his reserved and disagreeable, as it were, hostile attitude, was quite disliked by them as they got to know him better; and they were glad when the sittings were over, and they were left with a magnificent portrait in their possession, and he gave up coming. Golenishtchev was the first to give expression to an idea that had occurred to all of them, which was that Mihailov was simply jealous of Vronsky. Vronsky defended Mihailov, but at the bottom of his heart he believed it, because in his view a man of a different, lower world would be sure to be envious. Anna’s portrait–the same subject painted from nature both by him and by Mihailov–ought to have shown Vronsky the difference between him and Mihailov; but he did not see it. Only after Mihailov’s portrait was painted he left off painting his portrait of Anna, deciding that it was now not needed. His picture of medieval life he went on with. And he himself, and Golenishtchev, and still more Anna, thought it very good, because it was far more like the celebrated pictures they knew than Mihailov’s picture. Mihailov meanwhile, although Anna’s portrait greatly fascinated him, was even more glad than they were when the sittings were over, and he had no longer to listen to Golenishtchev’s disquisitions upon art, and could forget about Vronsky’s painting. He knew that Vronsky could not be prevented from amusing himself with painting; he knew that he and all dilettanti had a perfect right to paint what they liked, but it was distasteful to him. A man could not be prevented from making himself a big wax doll, and kissing it. But if the man were to come with the doll and sit before a man in love, and begin caressing his doll as the lover caressed the woman he loved, it would be distasteful to the lover. Just such a distasteful sensation was what Mihailov felt at the sight of Vronsky’s painting: he felt it both ludicrous and irritating, both pitiable and offensive. Vronsky’s interest in painting and the Middle Ages did not last long. He had enough taste for painting to be unable to finish his picture. The picture came to a standstill. He was vaguely aware that its defects, inconspicuous at first, would be glaring if he were to go on with it. The same experience befell him as Golenishtchev, who felt that he had nothing to say, and continually deceived himself with the theory that his idea was not yet mature, that he was working it out and collecting materials. This exasperated and tortured Golenishtchev, but Vronsky was incapable of deceiving and torturing himself, and even more incapable of exasperation. With his characteristic decision, without explanation or apology, he simply ceased working at painting. But without this occupation, the life of Vronsky and of Anna, who wondered at his loss of interest in it, struck them as intolerably tedious in an Italian town. The palazzo suddenly seemed so obtrusively old and dirty, the spots on the curtains, the cracks in the floors, the broken plaster on the cornices became so disagreeably obvious, and the everlasting sameness of Golenishtchev, and the Italian professor and the German traveler became so wearisome, that they had to make some change. They resolved to go to Russia, to the country. In Petersburg Vronsky intended to arrange a partition of the land with his brother, while Anna meant to see her son. The summer they intended to spend on Vronsky’s great family estate.